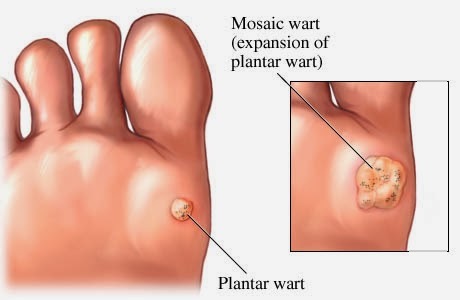 Corns and calluses (hyperkeratosis) are painful areas of thickened skin that appear between the toes, on the soles of the feet. Corns and calluses generally form when the skin tries to protect an underlying area from injury, pressure or rubbing. Corns and calluses are caused by pressure or friction on skin. A corn is thickened skin on the top or side of a toe. Most of the time it is caused by bad fitting shoes. A callus is thickened skin on your hands or the soles of your feet. The thickening of the skin is a protective reaction. For example, farmers and rowers get calluses on their hands that prevent blisters from forming. People with bunions often develop a callus over the bunion because it rubs against the shoe. Corns and calluses are not serious problems. Your health care provider will make the diagnosis after looking at your skin. In most cases, tests are not needed. Preventing friction is often the only treatment needed. If poor fitting shoes are causing the corn, changing to shoes that fit better will get rid of the problem most of the time. Protect the corn with a doughnut-shaped corn pad while it is healing. You can buy these at most drug stores. Calluses often occur due to excess pressure placed on the skin because of another problem such as bunions or hammertoes. Proper treatment of any underlying condition should prevent the calluses from returning. Wear gloves to protect your hands during activities that cause friction (such as gardening and weight lifting) can help prevent calluses. If an infection or ulcer occurs in an area of a callus or corn, the tissue may need to be removed by a health care provider. You may need to take antibiotics. Corns and calluses are rarely serious. They should improve with proper treatment and not cause long-term problems. Check your feet carefully if you have diabetes or numbness in the feet or toes. Otherwise, the problem should resolve with changing to better-fitting shoes or wearing gloves. You have diabetes and notice problems with your feet. You think your corn or callus is not getting better with treatment. You have continued symptoms of pain, redness, warmth, or drainage from the area.